Baby Joseph’s family fought the Canadian medical establishment from October to March 2011 to help their child breathe. Moe and Sana Maraachli were refused a tracheotomy for their son, and were told that because their baby has a fatal neurological disease, that further treatment would be "futile." Working with many others, we at Priests for Life arranged to have the baby transferred to Cardinal Glennon Children’s Medical Center in St Louis. He received the tracheotomy and on Holy Thursday, 2011 Baby Joseph went home to Canada with his parents. The Priests for Life Family, including tens of thousands of people who sent emails to the Canadian authorities, is delighted to have helped. Priests for Life has also agreed to pay for Baby Joseph’s medical expenses. Learn more about this story from beginning to end below in the various videos, photos and news items and read of the many lessons that can be learned from the story of Baby Joseph. 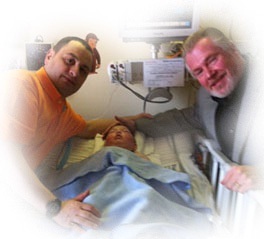 In the photo, Baby Joseph's father, Moe (left) with Jerry Horn, Senior Vice President of Priests for Life. Baby Joseph was baptized in St. Louis and Jerry was asked to be his Godfather. Who is Baby Joseph and Why Should I Care?